Hi everyone, you guys successfully helped me fix a Yamaha amp of mine a couple years back and I’m sorta stumped with my new project. At the very least, documenting my progress on here was helpful in keeping track of my thoughts during that last project. 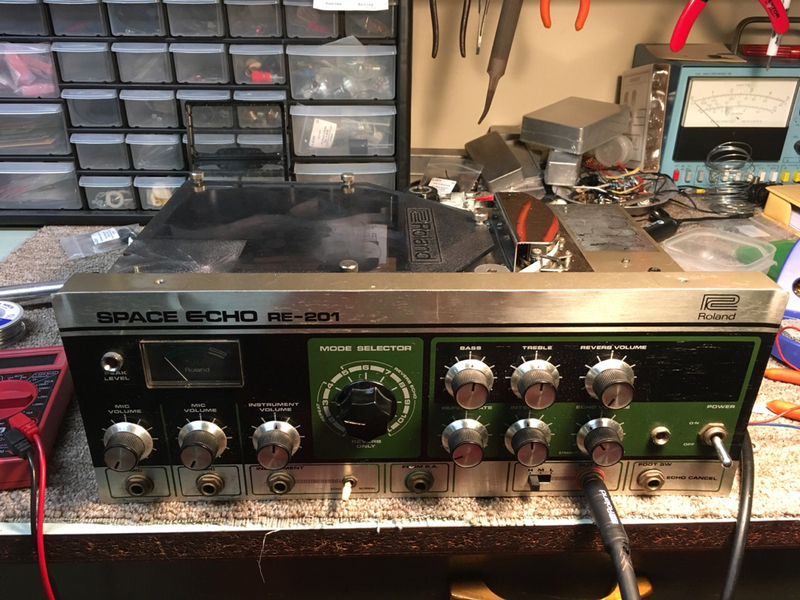 So, a friend bought this Re-201 in as-is condition for a very low price and wanted me to look at it to check it out once he got it in. Initially the motor was not turning smoothly and had a bit of a slump mid rotation. The signal from the output was also moderately noisy and the repeats sounded like warbled garbage. On some settings you may hear a pronounced initial repeat (still sound like warbled garbage), but then the repeats almost immediately fade out. You can hear the warbliness in the noise from the unit without having anything plugged in. The motor not turning smoothly was the most obvious problem with well documented solutions so I addressed that first. I know the motors on these need serviced all the time so I replaced the top bearing in it and voila, it rotates normally now. I used the tutorial that the echofix.com guy has shared on his site. Very helpful walkthrough. So I plug it back up after motor rotating normally and the warbly garbage is still there. I can hear my guitar signal fine, the spring reverb works and sounds great, it’s just the tape repeats section that is acting wacky. I also replaced the tape and it did not change the problem. I also cleaned all the tape heads and made sure they were properly aligned in the tape’s path using the procedure recommended by the echofix.com guy. The service manual linked below has all the maintenance procedures, schematics, pcb charts, etc outlined in it, but most of the maintenance procedures require the use of a scope which I don’t have. The only trimmers I attempted to adjust was the intensity and coil trap because they either didn’t require a scope or only needed a DMM. Both tested fine and did not affect the problem. One kinda weird thing is that this is a European model Requiring 220v. It’s hooked up to a converter so it should be getting the voltage it needs. The seller had also sent a video to my buddy before he bought it and it showed that it essentially had the same issue... so the warbled garbage was there before it got in our hands. I’m just not sure what to look for next. I inspected connections, caps, etc and nothing looks out of place. The seller of the unit told my buddy that he had it sent off to be serviced by a professional somewhere who specializes in fixing these. I can tell that most all the electrolytics were replaced, but it’s not obvious what else may have been done to it. Any ideas of what to do next? Thanks! I'll bet my last dollar this is purely a mechanical issue. It most likely has at least one drive belt so check it, as they stretch over time. I've fixed 100's of cassette players with worn out belts and capstan wheels. The rubber on the capstan dries out and becomes hard = slipping tape which = the warble. Check the pin wheel and all the guides for a wear grove as that can cause issues. In other words there are several places that will cause warble and they will all be due to a mechanical issue. Any bearings will dry out over time so check they all roll freely. Thanks for the feedback! I will Check it over for more mechanical issues tonight, I suppose I gave up on thinking it was mechanical because of how the echo dies so quickly. I can understand the warble from a mech issue, but the echo decay seemed like it would be something else. I’ll keep y’all updated! So, Hallelujah, it’s fixed. I looked at the tape path and any mechanical issues and I think rather than it being any one thing it was lots of little things that just needed to be cleaned and re-aligned. The biggest thing, I think, was messing with the pinch wheel. It had a ton of cruddy grease on the spindle so I cleaned all that up, as well as all the other wheels in the tape’s path. Thanks for the encouragement to give all that stuff another go, it really paid off!